Heat a dry frying pan and add the cumin and coriander seeds. Fry over a medium heat, moving the spices around the pan frequently to prevent them from burning, for 2-3 minutes, or until aromatic and lightly browned. Transfer to a mortar and grind with a pestle. In a pan, heat the vegetable oil and fry the onion and garlic over a medium-low heat for 6-8 minutes, or until softened. Add the ground toasted spices, the cinnamon stick, ground turmeric, cardamom pods and cloves and cook for 2-3 minutes. Add the rice, broad beans and stock, cover the pan with a lid and cook over a low heat for 12-15 minutes, or until the rice is tender. Meanwhile, heat a griddle pan until smoking. Brush the courgettes with the olive oil, season with salt and freshly ground black pepper then cook on the griddle for 2-3 minutes on both sides, or until charred and softened. Set aside. To serve, stir the butter into the pilaf until melted, then spoon into serving bowls and top with the griddled courgette pieces. Garnish with chopped fresh parsley, a squeeze of lemon juice and a dollop of yoghurt. 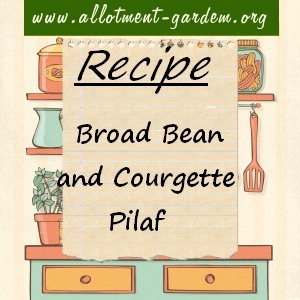 I was struggling to find a simple broad bean recipe (other than risotto), so this was a great find. I added some chopped ginger along with the onion/garlic, but I wish I’d added some chilli as well to give the meal a bit of a kick! Definitely add lemon juice at the end as it lifts the entire dish. 10g of butter is more than enough. I garnished with coriander and mint, rather than parsley.